Hikari is a publisher of journals in science, technology and medicine founded in 2005. They used to be in the DOAJ 2015, but in 2016 the publisher isn’t mentioned in the directory. The publisher didn’t change the amount of their OA APC. The majority of the journals still charge processing fees but they no longer charge publication fees in the fields of medicine and economics. This means that of their 20 journals, 4 of them no longer have publication fees. 25 percent of their journals have no publication fees. The journals that still have publication fees charge 200 EUR per page up to 8 pages and an extra 25 EUR per pages for the additional pages. Medknow is an emerging commercial scholarly journal publisher based in the developing world (India) that is owned by one of the oldest and most traditional western-based commercial publishers, Wolters Kluwer, that publishes in partnership with many long-standing traditional society and university journals. Even though the publisher is for-profit by nature, the majority of journals do not charge APCs. Of the journals that do charge APCs, most have not changed price between 2015 and 2016; some journals are adding or dropping APCs, and a few have lowered their APC. However, we identified 16 journals that did raise APCs from 2015 to 2016, in some cases by substantial amounts (over 50%, some even doubling or tripling in price). Medknow is a commercial publisher of peer-review medical journals that originated in India. This publisher has partnerships with many associations, societies and universities and its publications include many long-standing not-for-profit journals. Of the 141 journals published by Medknow, more than half (83 journals) are published in partnership with universities and learned societies. A traditional commercial scholarly publisher, with a history dating back to 1836, Wolters Kluwer, acquired Medknow in 2011. The reason for mentioning this is as one example of how the distinction between traditional and open access publishers may not be as relevant today as it used to be. 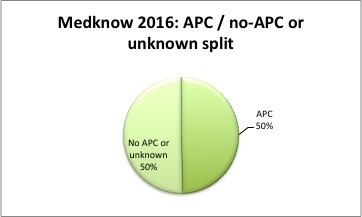 The partnership with the not-for-profit societies and universities likely explains why less than half of Medknow journals (70 journals) charge an APC as of 2016 (an increase from 61 journals with APCs in 2015). In 2016, there are 26 journals that clearly state that there is no processing charge, down from 28 journals in 2015. It is not always clear whether there is an APC or not. In 2016 we note 38 journals with no cost found (meaning we did not find either an APC or clear language stating that there is no APC), down slightly from 41 in 2015. There 28 publication in 2015 that have no publication fees and in 2016 26 publication have no processing charge. Widlyne compared the averages of the article processing charge for the year of 2015 and 2016. The average in 2015 was $285 and in 2016, $173 in US dollar. While the price seems to have decreased, this likely reflects currency fluctuations as the primary currency for a large portion of the journals is not USD, for example Indian rupees as the primary currency is very common. So this information should not be taking as a proof of the decrease of APC. Comparing prices on a journal-by-journal basis, most of the prices did not change (31 journals had exactly the same price). Four journals lowered their APC and two no longer charge APC’s. 16 journals have increased their APCs, this table show which journal have increase their APC’s, the amount for 2015 and 2016 and the percentage of increase.